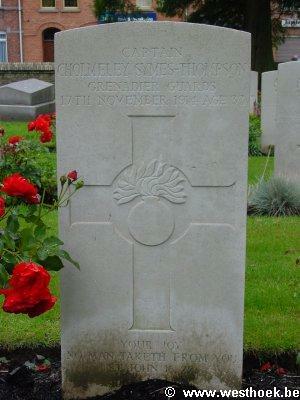 Captain CHOLMELEY SYMES-THOMPSON 2nd Bn., Grenadier Guards who died on Tuesday 17 November 1914. Age 33. 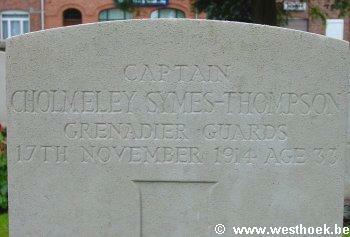 Captain CHOLMELEY SYMES-THOMPSON 2nd Bn., Grenadier Guards who died on Tuesday 17 November 1914. Age 33. Son of the late Dr. Edmund Symes-Thompson, F.R.C.P., and Elizabeth Symes-Thompson; husband of Grace E. J. Symes-Thompson (nee Churchill), of 43, Argyll Rd., Kensington, London. ZILLEBEKE CHURCHYARD Grave F. 2.